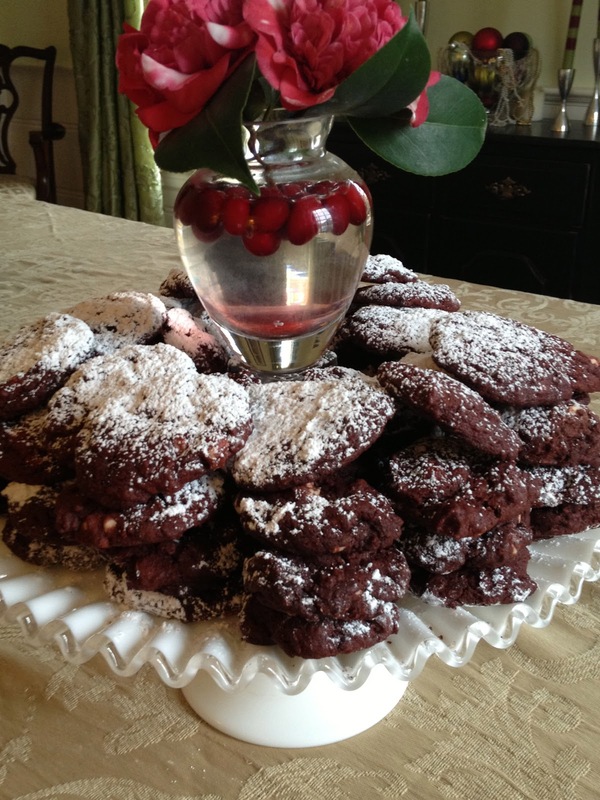 Red Velvet Cookies Recipe is a holiday favorite for Christmas or Valentine’s Day. 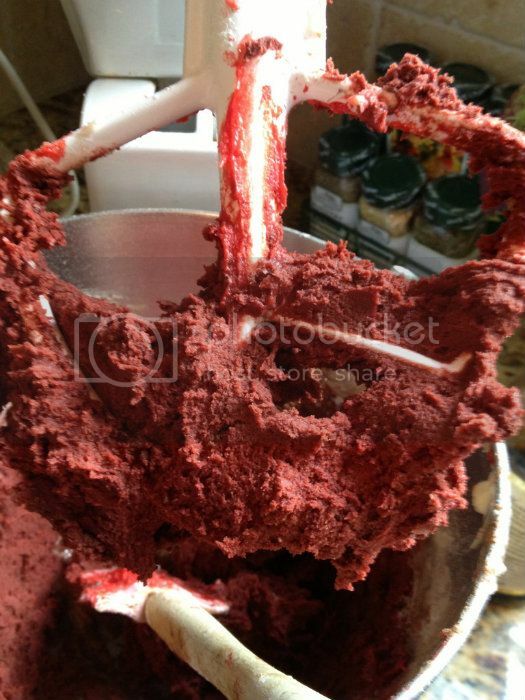 Nothing says Happy Valentine’s Day like Red Velvet batter. 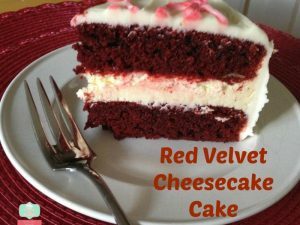 I fell that you can find red velvet recipes from coffee syrups to yogurt flavors. It is the newest fad in cooking I guess. This year’s cookie exchange recipe was inspired from a visit to Panera Bread. 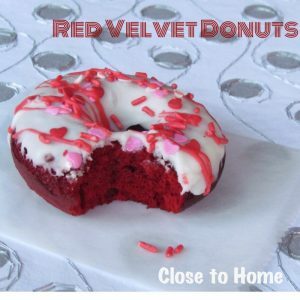 Check the other amazing red velvet donuts and red velvet cakes. These Red Velvet cookies were really easy to make. I have found that most red velvet recipes are not very moist but I like the addition of white chocolate chips. This gave them a little extra texture and flavoring. When I doubled the recipe for the second batch I feel like they did not flatten out into these perfect circles. Most of you will not have to double the recipe but I needed 5 dozen cookies. Thought they needed a little powdered sugar on top too. It was too boring on the platter. Add a little vase of cranberries and camellias and we have a cookie party platter I used in Christmas. For Valentine’s Day you can box them up with a little ribbon and you will make anyone’s day. Cream butter and sugars. Add egg and vanilla, mixing well. Beat in food coloring. Stir in flour, baking soda, salt and cocoa powder until just combined. 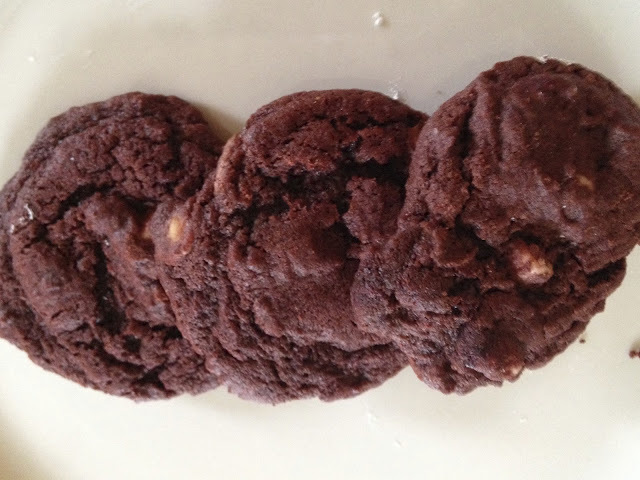 Drop by rounded teaspoon onto an un-greased cookie sheet and bake in a preheated 375 degree oven for 10-12 minutes. Let cool slightly before transferring to wire racks. Sprinkle the tops with confectioner's sugar. Very and different kind of cookies. Your platter looks beautiful. 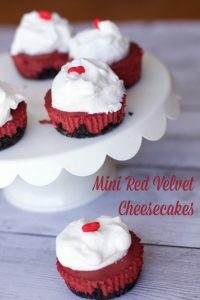 I love the idea of red velvet for Valentine’s Day. very pretty and the cookies looks so good! I love the sound of these. I haven;t had much red velvet stuff actually. I will have to give these a try. YUM!! I’ll take a doz!! I really need to try this out!! cooking I mean!! These look yummy. I love the pictures. These look yummy! Red Velvet is my favorite! These would be perfect for Valentine’s Day. Yummy! I need to start baking now for all of the events we have going on for V-day. 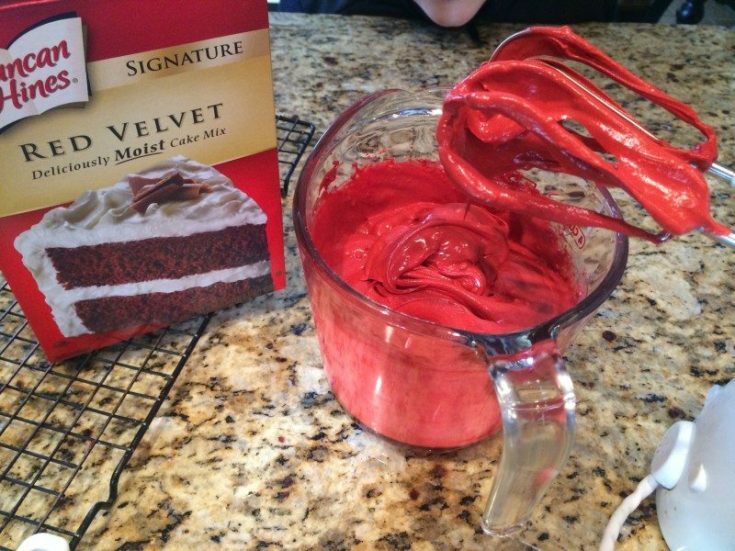 I love red velvet anything! these look amazing! Those are looking good!! Not big on Valentine’s Day but I wouldn’t mind making these just because! that looks delicious, a nice Valentines Day treat!